5 reasons I’m obsessed with body-weight training. In kinesiology this is called kinesthetic intelligence, people who have a high level of kinesthetic intelligence generally have excellent motor skills and coordination. They are often very physical and are keenly aware of their bodies. Kinesthetic intelligence is something that can be improved with a good bodyweight training program. 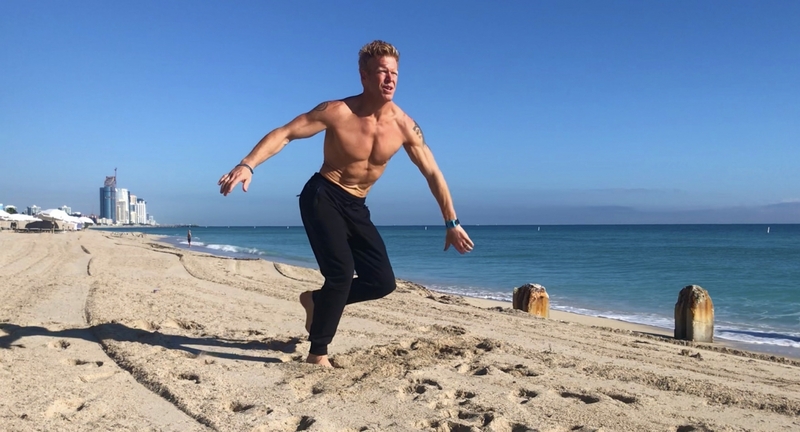 When training your body to perform exercises that will help improve your gross motor skills, you will ultimately learn to move more effectively while bringing more awareness to your body and its position in immediate space. Put it this way, if you are more aware of your body in it’s space while let’s say dancing, chances are you will feel a little more comfortable and look more fluid at the same time. Bodyweight exercises that demand more muscle control and balance will help your body move more intelligently. Since You can use your own body resistance by doing push ups, squats and more to develop longer, leaner muscle instead of the bulky muscle that comes with heavy lifting. Instead of just burning fat with cardio, body-weight training helps you build muscle to replace fat with lean tissue. The more muscle to fat ratio, the faster your metabolism becomes. A faster metabolism means you burn fat more effectively. Bodyweight training is incredibly effective for building muscle. … However, there are still those who argue that bodyweight training isn’t as effective as weight lifting when it comes to building muscle. Since bodyweight Training is often a military style, endurance oriented workout, is should not be mistaken for its muscle building capabilities. For instance your ever see a gymnasts physique? Enough said. I like to compare it more to a sport like skiing or tennis. I know, how do you compare push-ups and crunches to skiing? Well if you where to think of the skill levels of skier like beginners (green circles), intermediate (blue squares), and experts (black diamonds) you can compare it to an exercise progression. For instance, you can perform a basic strict push-up (green circle), you can do a “delt tap” push-up (blue square) or an Explosive “chest clap” push-up (black diamond). All three progressions have a skill, strength and ability level. Over time as your ability, strength and skill level increases, you can perform more and challenge yourself to do more dynamic movements that will keep you far from boredom. Consistent bodyweight training builds structural balance, meaning you have balanced muscles front and back as well as side to side. Many people train what only they see in the mirror, while neglecting some of the most critical areas for pillar movements like pushing and pulling as well as squatting and lunging. This can affect our posture and lead to structural imbalances. One of the things I reinforce when working with clients is “its all about hips and glutes”. This is where most athletic movements are driven from. The gluteus maximus is the largest muscle in the human body. It is large and powerful because it has the job of keeping the trunk of the body in an erect posture along with acting as the chief antigravity muscle. Chris Vlaun performing a walking prisoner lunge. There are many more great reasons to incorporate body-weight training to not only achieve your fitness, but to prepare you for life. It’s functional, it’s athletic and gets you ready for your sport, occupation or activity that you will use on a daily basis. **Bonus: A study posted in the Journal of Strength and Conditioning Research found that cadets at the US Military Academy who performed bodyweight exercises such as squats, push-up and lunges sprinted faster and jumped higher than those who did a static warm-up routine. For information about our online bodyweight training program visit us here. https://www.v-artofwellness.com/wp-content/uploads/2019/02/Body-weight-beachfit.jpg 1087 2012 admin https://www.v-artofwellness.com/wp-content/uploads/2014/12/v-art-of-wellness-logo-web-4.png admin2019-02-25 16:12:172019-03-01 11:11:085 reasons I'm obsessed with body-weight training. I love to have a vast variety of workouts no matter where I am or how I feel without depending on a gym. Choosing an outdoor environment only enhances the experience. Here is one of my recent workouts that I wanted to share with you. Enjoy!